The Unibook™ Character Browser is a tool developed by ASMUS, Inc. to present information about the characters defined in the Unicode Standard and the International Standard ISO/IEC 10646. Using Unibook, you can print and search listings of character codes and names, as well as display and search a variety of information about Unicode characters and their properties. Unibook can be used to look up unknown characters copied from a document and to generate the Unicode value for any character for pasting into documents. 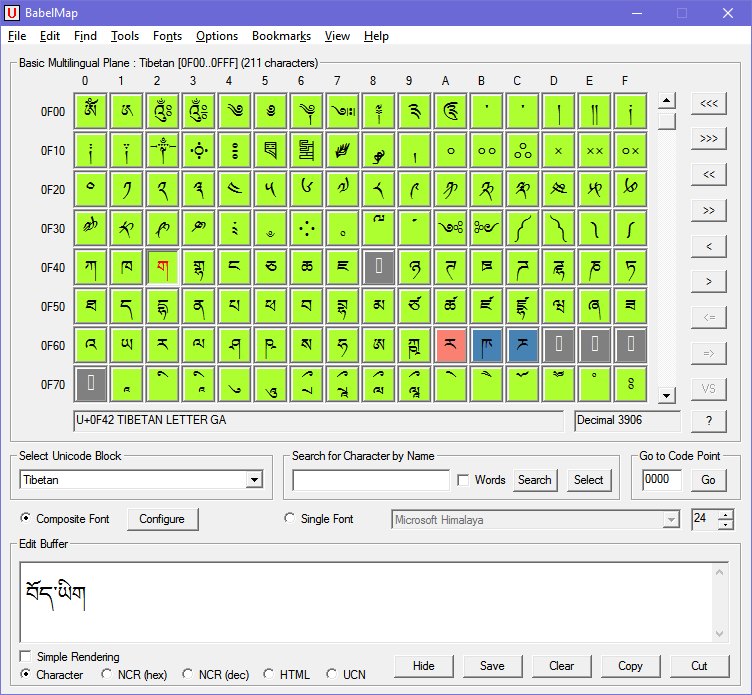 BabelMap is a free character map application for Windows that allows you to browse through the entire Unicode character repertoire of over 128,000 characters, or search for a particular character by name or by code point. Characters can then be copied to the clipboard for use in any Unicode-aware application. It also provides many useful features and special utilities. BabelMap supports the most recent version of the Unicode Standard. 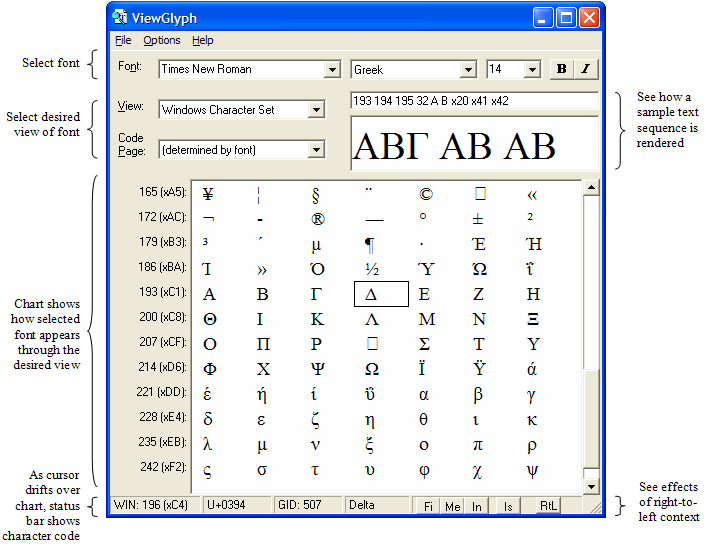 ViewGlyph can show you the raw glyph palette, which is useful if you are writing smarts (i.e. OpenType, Graphite, or AAT tables) for your font. You can view certain TrueType font tables (name and cmap) and see various font metrics. Finally, ViewGlyph is useful for investigating how Windows maps 8-bit characters into Unicode through various codepages. 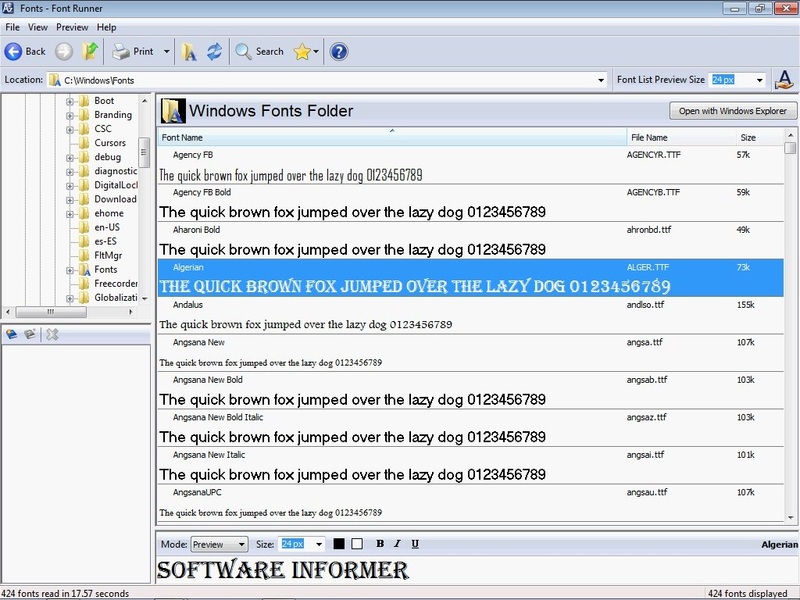 This small tool shows all true type fonts on a Windows system and allows to browse through all codepoints (characters). See whether your fonts contain chinese, arabic or hebrew characters. Get a short description of the selected character and compose a unicode string which can be copied to the clipboard and used in other applications. This way you can use the viewer as simple IME (input method editor) replacement. Ttfautohint by Werner Lemberg is a free font utility, which goal is a 99% automated hinting process for web fonts, acting as a platform for finely hand-tuned hinting. Ttfautohint is a library written in C that takes a TrueType font as the input, removes its bytecode instructions (if any), and returns a new font where all glyphs are bytecode hinted using the information given by FreeType’s auto-hinting module. The idea is to provide the excellent quality of the auto-hinter on platforms that don’t use FreeType. Font hinting (also known as instructing) is the use of mathematical instructions to adjust the display of an outline font so that it lines up with a rasterized grid. At low screen resolutions, hinting is critical for producing clear, legible text. This tool has automated the hinting process for web fonts so that your fonts displays nicely on all the browsers and platforms. This tool is powered by the excellent hinting tool ttfautohint. PxtoEm is a pixels to relative em units conversion tool. Just choose your body font size in pixels, whereupon it generates a complete conversion, making fluid web design simple. Once you’ve chosen a font size, for example, 12px, find that number in the left column; the convertor will highlight the corresponding em conversion. With our 12px example, the percentage is 75%, which is what you will insert into your stylesheet. The highlighted numbers in the middle table will apply to the various elements within your stylesheet, such as H1, input, blockquotes, etc. The right-hand table allows for custom conversions. Once you have everything you need, click “Get CSS” at the top of the page, which contains baseline code for you to use. When working with type it’s important to be consistent with your font sizes by composing on a scale — Pxtoem can help with this process. Find my Font is a simple yet powerful application for identifying the fonts in any digital image. The cleaned up font list includes over 125,000 fonts (41,000 free, 84,000 commercial) while the average matching speed is less than 3 seconds. 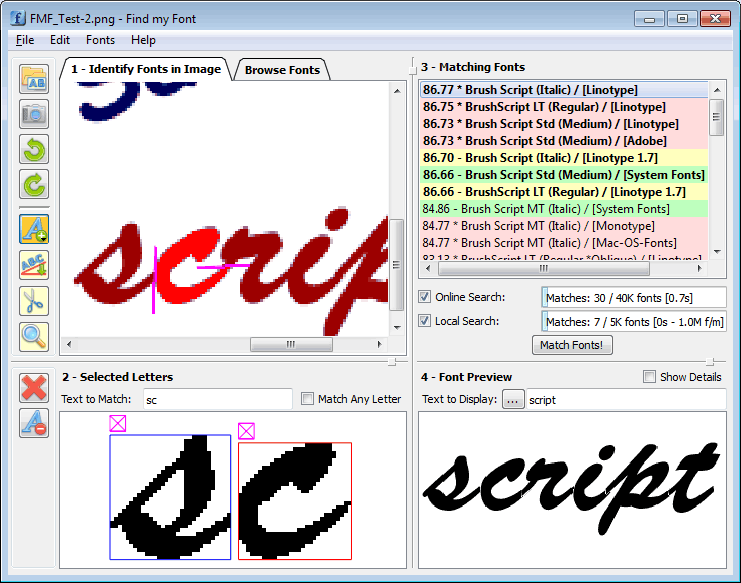 Find my Font is a reliable, fast and accurate personal font identification software application. Now Find my Font identifies twice as many fonts in half the time! This is a simple HTML-based Unicode character picker intended to allow easier access to the full range of Unicode characters right from your browser. This is a simple HTML-based Unicode character picker intended to allow easier access to the IPA range of Unicode characters right from your browser. This utility can be characterized as an online extended character map oriented towards writing characters. It displays a table that looks like a set of keyboard buttons, and clicking on a button you enter the character in question. The characters will be appended to the text input area on the right. Acute Font Report Lite gives the ability to preview OpenType and TrueType font properties including which OpenType features are supported. Wakamai Fondue, a tool that tells you what your font can do. a tool that would make it easy for webdevelopers to see which layout features are in the font, to which characters they apply, and what CSS you’d need to enable them on the web. The generated CSS cascades and can be combined by applying a class per layout feature, something that’s usually hard to do due to font-feature-settings not cascading and the lack of support for font-variant-*. Note that fonts aren’t being uploaded to a server—everything is processed locally in your browser.